The location of Mill Cottage is absolutely stunning and the cottage itself is well pointed and well maintained. It's such a great getaway - so peaceful and relaxing. We had a great time there and look forward to returning. Our week at MIll House was the perfect place to escape. This delightful cottage is warm cosy and very comfortable. Nestled in a perfect setting with spectacular views. Close to Barbon with a great village pub and a short drive from Kirkby Lonsdale. Fabulous for walking, exploring the Lakes and Yorkshire Dales. HIghly recommend! Great stay in very comfortable cottage in a great location between the Dales and The Lakes. Kirkby Lonsdale is a fantastic village with great places to eat and shop ! The four of us enjoyed a great meal in the bar at The Barbon Inn where the staff were incredibly helpful and friendly. Having walked there across the fells , we staggered back to the cottage along the lane ! We had the most amazing stay at Mill House Cottage over Christmas. Well appointed and comfortable cottage is stunning location yet within easy walking distance of the local village and The Barbon Inn. Gorgeous cottage in outstanding location. We had a lovely break in this comfy cottage in a great location for the Dales, the Lakes and the coast. Last stayed in Southerdale 7 years ago so knew what was available. However, the freezer badly needed defrosting as we found it was not closed properly on arrival so had iced up. Fortunately we only used it to freeze our ice packs. We had a lovely king size bed made up of the zip together singles. The mattress cover was not big enough to cover the 6 foot wide bed so kept coming off from the top corner of one side. It really needs a larger mattress cover. These issues did not cause us any problems so are purely constructive criticism. We will hopefully return in the near future. Thank you. The location is peaceful and quiet away from the more crowded tourist areas. Quaint with beautiful surroundings. Great pub food for vegetarians and good walks around. Idylllic location for all sorts of rest and relaxation. The lanes leading to the property are challenging but the group of cottages are marvellous especially for people who want to be in the same place but not in the same cottage!! Love cottage and lots of places to go walking. For my wife and I we enjoyed our stay. Lovely and peaceful,views beautiful and the cottage was comfy and had everything you need. My wife’s elderly Mum and Dad found it difficult to get up and down the stairs more so at the top as it turns. Other than this the had nice time. Mill Hill Cottage was everything we expected and more! The owners were great! Accommodated our every need. The surroundings were amazing! Beautiful little cottage nestled in spectacular views. Many places to go and see and great walks on your doorstep! We achieved climbing Scarfell Pike! Cruise on lake Windermere. Visited the caves and cycling at Grizdsle forest . Could have stayed another week but will definitely come back! Would highly recommend a stay at Mill Hill Cottages. The cottage lived up to all expectations assisted very well by some glorious weather. Perfect setting for a chilled getaway we relaxed within minutes of arriving. A very relaxing and comfortable house in a lovely area. We have stayed in several Mill House properties on the estate because we love the area and know that we will arrive to a clean and comfortable house. The owners, Julie and Stephen Bolton, really care about your stay there so if there is ever any small issue or anything that you need, they deal with it promptly and courteously. The properties on the estate have lovely views down along the valley and vary in size and price so are perfect for most sizes of family. The booking dates are very flexible too which is a real bonus sometimes. There are others in different locations but we love the Mill House properties. They are close to Sedbergh and Kirby Lonsdale where there are shops, cafes, restaurants and other things to do should the weather let you down. Wonderful second hand book shops in Sedbergh. We prefer this area to the lake district as it is always quieter and more relaxing. The walking is more pleasant for us too. We hope to continue taking holidays at Mill House. A well presented and comfortable cottage with beautiful views. This is the third time we have stayed at Mill Cottage and it is ideal for a short break. The size of the cottage is ideal for a couple. Enjoyed our stay in this cosy cottage, with wonderful views over Middleton Fell. Great location for visiting the Yorkshire Dales and the Lake District. Nearby Kirkby Lonsdale and Barbon are well worth a visit with great scenery. The cottage is in excellent condition and from some photos of the front room in the shop which the furniture is different to reality it must have been refurbished recently. All mod cons are available and the decor is contemporary/shabby chic yet the cottage retains lots of character. Very clean. Very warm. Cosy. 10 minute drive from Kirkby Lonsdale (not walkable). Mill Cottage is one of our favourite cottages, very comfortable in a superb location right on the edge of the moors. Lovely property, great area for walking. Only disappointing part was the quality of the mattresses in the non en-suite room, they really need to be replaced. Other than that we had a lovely stay. Many thanks. This was our 13th visit to Mill House Cottages. The overall experience never fails to impress nor does the care and attention of the owners, Julie and Stephen. Excellent cottage in a fantastic location , I could'nt fault a thing. If you want total peace and quiet and a refreshing break this is the place for you. Stayed at Mill Cottage several times and it never fails to disappoint. The setting is perfect and to be able to go back to such a wonderful, well equipped cottage when the weather is bad makes things so much better. Would highly recommend a holiday in this wonderful scenic area and Mill Cottage. Mill Cottage was in a quiet countryside location and the cottage itself was well designed and suited us perfectly. A short drive gave us access to the 3 Yorkshire Peaks and some lovely walks. Would definitely stay again if heading back to the Yorkshire Dales. We (2 adults and 2 children) spent a very enjoyable few days in Mill Cottage and would not hesitate to return. The feeling of remoteness yet being only 15 minutes drive from Kirby Lonsdale made the location even more appealing. This made for the perfect weekend for my son's 18th Birthday. We hired Howgill's and Mill House cottage, both were superb. Mill House is an old favourite and it is completely refreshed after the redecoration, it has been really tastefully done. They both were comfy, cosy and had all the little touches you could hope for. Enjoyed mill house brill location very friendly owners had to go home early due to sickness.would love to go back sometime. Bill. I should start off by saying that we rarely holiday in the U.K. for one reason - I am very fussy about accommodation. However, on finding the Mill House Cottages website I felt I'd found what I was looking for...and I certainly wasn't disappointed, the cottage was every bit as gorgeous in real life as it looks in the photos. The setting is idylic; tucked away up a country lane with views to die for. We were lucky to have a couple of warm, sunny evenings and spent time sitting outside with a drink in total peace and quiet, away from the usual hussle and bustle. And it was just a short drive to the lovely little village of Kirkby Lonsdale where we dined out. Our hosts, Julie and Steven, were welcoming and friendly, and have clearly thought of everything. There was nothing more we could have wanted or needed in the cottage. From the charming welcome basket with freshly baked bread, butter, jam and wine....to dishwasher tablets, washing up liquid, etc, it's all there. The cottage was cosy and comfortable...especially on our PJ day in the pouring rain! The wifi meant I could watch Netflix whilst my hubby and daughter watched movies...and we snacked the day away. All in all it was a very enjoyable stay, and we hope to return soon. Walking into Mill Cottage is always welcoming because of excellent presentation, lovely decor and many thoughtful touches. And then there is the peace and stillness and the view! We have visited Mill House Cottage regularly since 2011. It is a delightful cottage that is very homely and warm. Ideal for walking direct from the cottage up into the fells. We will certainly be returning. Excellent cottage with lovely owners. The attention to detail in the furnishings but also the added extras (welcome basket, logs, dish washer tablets etc.) were appreciated. Would recommend and stay again! Having stayed with Millhouse Cottages on our honeymoon we thought we would come back for a spring break this time I'm Mill cottage. Great location to explore the area and the cottages are finished to a very high standard. Loved coming back to the wood burner! Great service again by Stephen and Julie who are always happy to go out of their way for you. Thank you for another great week and hope to be back again soon! A warm, well presented cottage with beautiful views. It was lovely arriving at Mill Cottage to find the house very warm and with a box of food luxuries left out for us. The decor was excellent, all facilities were tip top including large comfortable beds. While the house sleeps four there was only the two of us but with four people it would be more confined. The site is very accessible from the M6 and Kirkby Lonsdale is a very beautiful and interesting town while the fells all around are spectacular. The are plenty of options of walks from the cottage. The hosts who live nearby make you welcome but give you your space. The only cottage we keep returning to in forty years of self-catering; says it all. Quality, location, friendly proprietors. We had a lovely Christmas in Mill Cottage- 2 couples and one small springer spaniel. It was cosy and well 'kitted' out. The location was excellent and there is great walking from the doorstep. The bedrooms were quite small but the beds very comfortable. The cottage was great for us and look forward to another break soon. Our third time here and it just gets better. The location and property itself are stunning and we loved going on walks in the surrounding countryside especially with the stunning Autumn colour. Thank you so much for a wonderful stay! We can't wait to come back. Booked this cottage as a short break. It did not disappoint. Beautiful location with walks straight from the door. We are already planning a return visit next year with our Westie Woody. Some good pubs nearby if you want to eat out, but the kitchen at the cottage is very well equipped and once the log burner was lit we did not want to go out! We arrived at Mill Cottage to find the door open, so we just unpacked and settled ourselves in. There was no welcome from the owners, however, we felt they were there if we had needed them. The beds are big and comfortable, leaving little room around them to manoeuvre. As there were three of us, this potential problem was overcome by pushing the bed in the en suite bedroom as far to the side as we could. The location is lovely and very handy for walking and touring round. There are lovely places to sit outside which we were unable to take advantage of due to the horrible weather. All in all, a very nice break. Very comfortable. We booked this cottage for two on the basis that it would have a bit more room and were not disappointed. Each property is discrete and we were able to walk from the door onto the Dales. A great location for dipping into the Dales and the Lake District. Delightful, hidden and rural retreat. A place to recharge your batteries. We were amazed by the scenery and remoteness of the cottage. A great retreat. The accommodation was very compact but contained everything we needed. There were three of us and that was OK but think that had there been four, we might have been rather squashed. We loved the decor, each room was very tastefully furnished and comfortable. Wonderful holiday in a lovely quiet area. The cottage itself is in a remote location, only nestled between three other holiday cottages and the owners home. Fantastic views! The owners, staff and neighbours (a good walk away) are all very pleasant and helpful and happy to point out places of interest and advise on great places to eat and see. Cottage was lovely and comfortable and very clean! We had a lovely, relaxing stay at the end of the summer holidays. We had a fantastic three nights at the lovely Mill Cottage. The setting was beautiful - the perfect escape from the city! The cottage was so cute and cosy, finished to a high standard and spotless. The welcome basket and basic amenities made it so much easier for us to settle in and not need to buy unnecessary home goods. We will definitely recommend Mill House Cottages to our friends. We (husband and dog and I) have just returned from a lovely week staying at Mill Cottage. The accommodation is excellent. The cottage has a well equipped kitchen, comfy beds, tasteful decor and a well equipped kitchen. Small touches like fluffy (and expensive!) towels and a welcome hamper really create a sense of luxury. Mill Cottage is quite small, and though it has two bedrooms and bathrooms, it might feel a bit cramped for four adults. The location is absolutely beautiful with views of rolling hills for miles around. Each cottage has access to its own garden/field and this makes it ideal for dog owners. The cottage has good wifi and phone coverage is fine. We'll definitely be back and would definitely recommend the cottage to family and friends. This place is quiet and peaceful. The cottage is of the highest standard with all need catered for. Perfect for a peaceful break in beautiful surroundings. Will definitely be coming again. Our second stay at Mill Cottage, a beautiful cottage in a beautiful location. Wonderful walking right from the doorstep and a lovely area to explore if you want to get in the car. All enhanced by the friendliness of the owners and housekeeper. This is a cosy, clean and well-equipped cottage in a beautiful location. We had a fantastic time, I would highly recommend staying here. It provides easy access to both the Lake District and the Yorkshire Dales. Mill house cottage was amazing. Beautifully decorated with lovely touches throughout. It was nice to have our hosts nearby if we had any queries but they didn't intrude into our space. The location was amazing, such natural beauty. We will without a doubt visit again! Maybe try one of the other properties offered by this wonderful couple. This time we chose Mill Cottage as it has just been refurbished. We were not disappointed as the usual high standards have been maintained by Stephen & Julie who are excellent hosts. We all enjoyed our return visit to Mill House Cottages & Kirkby Lonsdale. Generally we liked the cottage very much, excellent location, however there were a number of things that could be improved. 1. Although we were expecting extreme weather conditions, it would have been good to have been warned in advance that the road surface had disappeared, fortunately we were in our 4x4 and not our other vehicle so it wasn't an issue. 2. The Shower needs a new head as squirting out sideways and water leaks down the living room wall on the left just before the stairs. 3. It could do with a little attention on the decorating in parts. We have enjoyed the summer sun and the winter snow while staying at Mill Cottage, but being there during Storm Desmond was a special experience! The footbridge behind the cottages was swept away and, lower down, the beck overflowed destroying the last 200 yards of the lane, marooning us in the cottage. But the support of the Mill House Cottages team was just superb, Sara and Peter made sure we were safe, warm and had food, and Stephen and Julie, away in New York, arranged for a contractor to make the lane passable so we could get out, and home. Absolutely wonderful care! We will be back, whatever the weather! Returned once again to Mill House and had yet another superb stay in a stunning location. Pity about the weather but the cosyness of the cottage more than made up for it. We couldn't fault our stay at Mill House Cottage - perfect location (need to drive a bit to get to places, but if you don't mind that, the view from the roads is beautiful), and the cottage has everything you could need, including well-equipped kitchen, great bath and shower, perfect bedding and comfort. Highly recommended! Stephen and Julie have made a perfect hideaway in an ideal location between the Lake District and Yorkshire Dales. The stone cottage is beautifully appointed with everything one could need in a home away from home and is very cosy and comfortable. Despite there being three other cottages nearby, it is completely quiet and private and we loved the sound of a nearby stream. 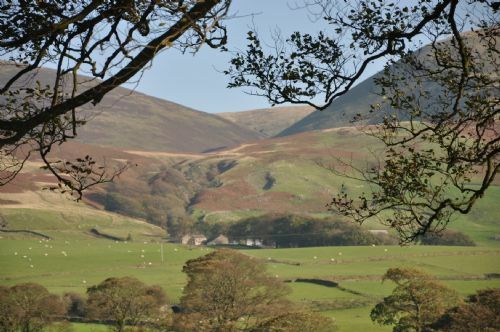 The location halfway up one of the fells affords stunning views as well as enjoyable walks right from the doorstep, yet it is only twenty minutes to the town of Kirkby Lonsdale with an excellent supermarket, cafes, restaurants and historic sights. Good wifi an added bonus. Stephen and Julie are also the perfect hosts, warm and welcoming and on call all the time (as we found when we had a plumbing problem). The welcome basket was the best we've ever had! The only suggestion would be to have a small wall cabinet in the bathroom with the shower. Definitely, a little gem of a cottage. We celebrated a birthday at Mill House Cottages with all of the family coming together. The setting was perfect, relaxed and just what was required for a short break. Kirkby is only 10 - 15 minutes drive away and has plenty of excellent restaurants to enjoy. I would strongly advise Avanti Resturant for an evening meal (book in advance). Mill Cottage really is wonderful decorated, exceptionally clean and well maintained. Plenty of room for 4 people to enjoy the comforts of a country cottage. Everything we needed (kitchen, comfort, guide wise) was thought of, the bed was lovely and excellent wifi signal. We had 6 people, 1 child and a small dog at one point taking advantage of this wonderful cottage and there were no complaints! Plenty of space for us to all eat and celebrate a fantastic birthday. Highly recommended as a relaxing spot and base to explore the lakes. Thank you to Julie and Stephen for assisting us in our devious plan to surprise my parents on my Mothers birthday. Thank yo so much for your wonderful review. It was a delight to meet your family and to be able to assist in making your Mum's birthday so memorable ! We had such a great holiday in Mill Cottage. The cottage was very well appointed with lots of attention to detail. Including a welcome pack with local bread and jam and also a bottle of wine. Such a beautiful and quiet location. We will definitely be back. Another lovely stay with our parents in law visiting from Australia - we usually stay at Southerdale or Northerdale and tried Mill Cottage this time with the enhanced family - another winning experience! Excellent accommodation in a fabulous part of the world. We love staying here and have done so for ten successive years since our daughter was three months old. . It is a super house in a quite special, beautiful part of England. There is loads to do whether you like cycling, real ale, good food, reading quietly by the fire, bird watching, cuckoo listening... deer spotting .... woodland walks...fell walks....old churches...villages with amazing tea shops....towns with quirky antique markets...it is all a stone's throw away. Within a minute of the front door is the most beautiful stream with little waterfalls which in itself is a fabulous spot for a picnic and for children to play for hours. Because of the location Mill Cottage boasts an extraordinary calm, helped by spotlessly clean rooms, proper cotton sheets, massive beds, proper towels, a top notch coffee machine and no intrusive ornaments, dried flower arrangements or left over bottles of tomato sauce and stock cubes from previous guests that lets loads of self catering accommodation down. Think White Company meets Hotel du Vin....with endless open space in every direction. This was the first time in the Lune Valley and we will definitely be back to stay at Mill House Cottages. The area is absolutely beautiful and so much quieter than the Lake District which is only half an hour away. We spent our time walking in both the Lakes and The Yorkshire Dales( which quite literally are on the doorstep). The choice of restaurants around Mill House are superb. We would recommend The Barbon Inn and The Highwayman. We walked a couple of times down the lane to the village of Barbon and enjoyed coffee and cake in the village store/coffee shop. Mill Cottage itself has recently been updated and the attention to detail is first class. It has everything you could possibly wish for, including a Nespresso coffee machine. The welcome hamper was excellent and Stephen and Julie are perfect hosts. We will definitely recommend Mill House Cottages to our friends and family. Lovely place, very good quality. High standard of decoration and furnishing. Lovely location. Bit of a hill up to the property so no walks down the lane for the elderly, also the shower has quite a high threshold step, so it's not ideal if you've got elderly/ frail people in the party. Everything inside the cottage was lovely. The laundry was very useful and well equipped. The location of the cottage was also ideal for us, beautifully rural combined with easy access to Kirkby L and the motorway. We can't wait to go back. A real hidden gem - a lovely cottage in a lovely location (and with lovely owners). Very comfortable and well equipped. Ideal for a romantic break away from 'hustle and bustle' but also in reasonable proximity to shops (and tea rooms). Ideal for a walking break too. Thank you so much for your very kind review. It was a delight to meet you both and we are delighted that you enjoyed your stay so much. Hope to see you again in the not too distant future. Not the first time I've been and won't be the last !! A fantastic peaceful place to stay, but within easy driving distance of both the Yorkshire Dales and the Lake District ; so you can have busy touristy days if it suits or peace, solitude and away from it all !! Thank you for your lovely review. We really appreciate your feedback. It was so nice to see you and Ted again last week. We are delighted that you love being at Mill House and feel so comfortable here. See you again ! We have enjoyed regular visits to Mill Cottage for ten years, and regard it as one of the best cottages we have rented, and our favourite. It is in excellent condition, in a beautiful location and wonderfully tranquil – right on the edge of the fells – and has first class owners. Mill Cottage is a joy; cosy, well equipped and comfortable. The cottage is in middle of nowhere (from a city dwellers point of view) but the local town of Kirby Lonsdale is a pleasure, helpful and generous; lovely basket of locally sourced goodies on arrival. This is our second time and wont be our last. A return visit. A stunning area complemented with a superb cottage. It is a struggle to leave the cottage to explore the area. Even in the mid winter a fantastic place to visit and stay. You will not be disappointed. Beautiful location and a cosy cottage. We especially enjoyed having access to lovely fell walks right outside the door. The children liked splashing in the streams. Some thoughtful little extras in the cottage like a bottle of wine and welcome basket and nice soaps. Great to have a drying room. Close to both the Lake District and Yorkshire Dales so lots of days out to choose from. Thank you, we will return! We chose Mill Cottage as a base for our first visit to fell walk in the Howgill fells and the Western Dales. It proved a superb choice both for location and quality. The cottage was clean and warm with all reasonable needs catered for. The hosts were very accommodating and friendly. We will return to further explore this area. We keep going back to Mill House Cottages (10 times now) for the comfort, the countryside and the welcome. The local eating is very good as is the local produce. Very enjoyable golf at Casterton, Sedbergh and Kirkby Lonsdale, and there's a great book shop in Sedbergh. On every visit we seem to find something new. On our latest visit we found a relatively new deli in Barbon. Excellent hosts in a quiet peaceful relaxing setting. This secluded cottage has everything that you require for a peaceful relaxing break. The cottage is neat and tidy with all the necessary amenities for a few days away. The nearby village has well stocked shops and many good restaurants. Even a game of golf was easily arranged. Our hosts could not do enough to ensure a pleasant stay. We thoroughly recommend Mill Cottages to any local or international guests. Mill cottage was immaculate and perfect for our needs. Remote location makes it the ultimate destination for peace and tranquility. Welcoming hamper was very generous and appreciated. Hosts were charming. Not a drawback for us, but Lakes were 45 minutes drive away. Highly recommend the cottage to stay in. Although we have stayed at Mill House Cottages many times, we are always struck by their cosiness and comfort. Located in a peaceful but stunning position under the fells, they give access to both the Lake District and Yorkshire Dales - there are even walks from the cottage door. I would like to thanks Julie & Stephen for a lovely cottage and location. Everything was provided for the stay attention to detail with comfort of home. I would recommend the cottage to others. Very cosy cottage, fantastic location! We had a wonderful week in this cosy and very well equipped cottage! Julie and Stephen gave us a warm welcome although we arrived late in the evening! The cottage is easy to reach from the motorway, very centrally located (between Lake District and Yorkshire Dales). We would really love to come back again! This is the third time we have visited Mill House Cottages and would definitely visit again. The location is excellent and ideal for walking in the Yorkshire Dales and the fells can be accessed directly from the cottages. Nothing is too much trouble to the owners, Stephen and Julie, who welcome you on your arrival and are always on hand should anything be needed. The welcome hamper is very much appreciated. We would be happy to recommend these cottages to anyone. Quality combined with stunning views and friendly owners. We highly recomend a stay at the Mill house cottages. We were made to feel very welcome. The views are a big distraction, enough to say you find yourself pausing what ever it is your doing to take the beautiful and changing views in. Howgills barn is a finely detailed cottage with a hi level of comfort. We saw more of the friendly owners here, than anywhere we have previously stayed. Julie and Steve are very accommodating even to the point of ensuring we had baby sun cream when we had miss placed ours. Lovely and quiet with great views and walks from the doorstep! Nice places to eat and shop a short drive/cycle away in Barbon, Kirkby Lonsdale and Sedburgh. Mill Cottage provided an excellent base for four. It is a comfortable, well equipped cottage very nicely decorated and in good order with easy parking and splendid views over the beautiful Lune Valley. It is our second stay at Mill House Cottages and di not disappoint. Steve and Julie are very helpful and spare no efforts to make your stay a pleasure. Situated at the foot of a fell, mill cottage is possibly one of the best located properties we have ever stayed in. The cottage is compact but so well organised that it is extremely comfortable, even with two large teenage boys! As keen cooks we found the kitchen extremely well equipped and generally everything you needed was in the cottage including a ready supply of logs, binoculars and a map of the local area. We thoroughly enjoyed our stay and would highly recommend both the cottage & the local area which was packed with beautiful walks and scenery. We were met by Peter on arrival bearing a box of lovely fresh eggs! The welcome pack is much appreciated. You know there will always be the essentials on hand plus a bottle of wine to help you settle in. Julie and Stephen always make sure that all is in place for a relaxing stay. We were very comfortable, Mill Cottage was warm; the beds are extremely spacious and contribute to a good night's sleep while being lulled by the sheep roaming the hills. We have lost count of the number of times we have stayed at Mill House Cottages. The area is lovely and the people are very welcoming. There is easy access to all types of activity but you can also enjoy the peace and tranquility of Mill House Cottages. There can be no doubt, we will be back. I stayed at Mill House for a week with a friend and didn't want to leave. The cottage was in a great location, well set up with lovely touches like the welcome basket. Beds were cosy and chairs difficult to rouse ourselves from. We spent the days wandering around the Lakes and enjoyed returning to our cosy cottage. Lovely. We're serial visitors to Mill House Cottages - need we say more! Previously we have stayed in Northerdale or Southerdale, which we love. This time we went for Mill Cottage - that bit more space. Cottages are lovely, clean and quiet yet close enough to Barbon and Kirkby Lonsdale as too not feel too for out of the way. Fabulous cottage, hidden away in the countryside. The cottage was well equipped and the owners were very friendly. Very much enjoyed the log fire, made the cottage very warm and cosy. This is the first time in a cottage, needed to be able to take my little dog with me. It was an excellent choice as we discovered, the cottage was sat in the most beautiful part of the countryside even in the middle of winter when we visited. The cottage is all that you see on the web site and more, excellently furnished in all rooms and it was a struggle to leave the surroundings to visit around the villages that where close by. It has made such an impression that I will be booking again. Highly recommended fist class facilities and surroundings. A cosy cottage in a beautiful spot. Lovely views from all the windows. Hosts were very helpful... Even collected a can of seat start for our broken down car! Made the end of our holiday a lot less stressful! Perfect location, excellent hand-off attitude (some places you get nothing but nosey owners and rule notices everywhere! ), perfectly clean (until we came with the muddy dog paws on the mat, sorry about that). Mill Cottage is ideal for a short break on the edge of the Lune Valley. An excellent location for walking straight out onto the fells. We recommend the nearby Barbon Inn. Mill House is a well equipped, excellent quality cozy self catering cottage. When we arrived there was a generous welcome pack with lovely food treats and thoughtful essentials for your stay as well as a limitless supply of wood, local OS map, dvds, games and books coupled with a friendly welcome from the owners and a really well thought guest information pack with suggestions of things to do locally means you want for absolutely nothing. We'll be back. Don't miss out, try it yourself, you won't be disappointed. A very nice cottage in excellent condition in a wonderful location, with great owners, there if you need them but who otherwise leave you alone. Really tranquil, right on the edge of Middleton Moor, with miles of moorland and filed walks for those with some energy. We have visited the cottages many times and every time has been as good as the last. It is somewhere that as soon as you open the cottage door and kick your shoes off you start to relax. There is always a warm welcome from the owners and sleep well in the comfortable beds. Stayed here several times and each time it has been a real pleasure. Perfect location for walks from the door and the Churchhouse cafe in Barbon is a must visit. The weather wasn't favourable, but that made no difference to us as our little cottage was so lovely, wirh spectacular views, even in the rain! On arrival, much later than expected, a welcome pack including a bottle of wine were just what we needed, and got our stay off on the right foot. The beds were huge and very comfortable, and we enjoyed relaxing for a few days in front of the woodburner. Would definitely recommend to friends and family. This is our 3rd visit to Mill House Cottages having stayed in Northerdale twice and Mill House Cottage once. We have found both cottages to be immaculate and very homely. There is a lovely hamper awaiting you on arrival at the cottage, which is a lovely gesture from the owners Julie and Stephen who always make you feel so welcome and nothing is ever too much trouble for them. The cottages are situated in a beautiful part of Cumbria up high in the fells with lovely views all around. It is an excellent area for walking and you can even access the fells from the door of the cottage. Have already booked for next year. Thanks so much for your detailed review. We are delighted that you enjoyed your stay so much and we look forward to seeing you again next year ! A lovely cottage set in a fabulous location. The grounds are very well maintained. I would have no hesitation in recommending Mill house cottages to anyone who wants a lovely peaceful holiday. It was a real shame we didn't get to meet the owners as they were themselves on holiday. They are clearly highly thought of by previous guests judging by the comments in the cottage guest book. So sorry we weren't around when you came. Hope to see you again at some stage in the future. Thank you so much for taking the time to review your holiday. This was our third visit to Mill Cottage. A beautiful location. Charming cottage. Spotlessly clean and always made very welcome. We are currently planning our next visit!